Salisbury NHS Foundation Trust are as passionate about skincare as they are about patients’ health. For that very reason, the judges of the Pharmacist Awards 2016 voted their innovative skincare brand, My Trusty®, winner of The Best Over the Counter Product award 2016. 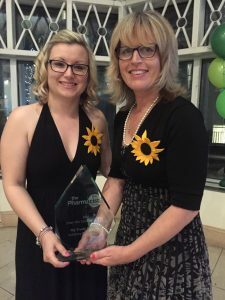 During a glittering award ceremony hosted by Zinc Media, to recognise and reward the most ambitious forward-thinkers in independent community pharmacies, a proud My Trusty® Team received a stunning glass trophy on behalf of Salisbury NHS Foundation Trust. ‘We are delighted My Trusty® has been recognised and endorsed by our pharmacists as it proves the difference our natural product makes on all types of skin’ says Linda Mace, Business Development & Sales manager for My Trusty. My Trusty® is a multiple award winning natural NHS skincare brand, developed by leading skincare scientists at Salisbury District Hospital. Dissatisfied with products generally available, research and development results showed a sunflower cream formula resulted in improved quality of newly healing and the general appearance, of skin. High grade sunflower oil was chosen as the primary ingredient because it is rich in Linoleic acid that has many beneficial properties for healthy skin. Steve Bleakley, Chief pharmacist at Salisbury Hospital says ‘the moisturiser has stood the test of time with its formulation and past and present patients still tell our pharmacy this is the only product that really does improve the quality of their scars’. Commented patient Lyndsey Weiss, ‘After trying dozens of creams to try and alleviate the discomfort of very sore hands and feet, caused by a reaction to chemotherapy drugs, I was recommended by my pharmacist to use My Trusty® unscented sunflower cream. This has made a huge difference to the condition of my skin – the cream absorbs easily and does not leave an oily layer. I really find it soothes and moisturizes far better than any other cream I have tried’ . Over many years the range has become an essential part of many people’s skin care regime. The sunflower cream formula helps to soothe dry itchy skin and is also suitable for people who may be prone to Eczema or other similar dermatological symptoms. And what is REALLY special ,all profits go back into patient care – how amazing is that! In addition to this latest award, My Trusty® continues to consolidate its reputation for providing quality skincare. ‘Our Trust members will be delighted to know that a product developed by Salisbury District Hospital is achieving such high recognition, especially knowing that all profits from sales are going back into patient care’. Isabel Cardoso, Membership manager Salisbury NHS Foundation Trust.